Klick Technology have been designing and installing IT rooms since computers were initially introduced into schools in the early eighties. We were the first to introduce a dedicated computer trolley to schools as part of the Microelectronics Education Programme in 1982. 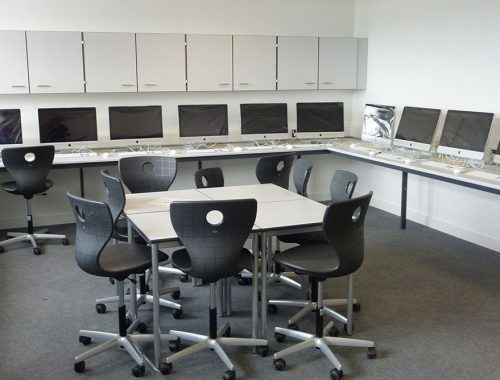 In that time we have developed furniture and layout designs that meet the very specific requirements of the Education Sector and the teaching profession. We understand the service logistics, the ergonomics and the difficulties of planning these areas and we can devise layout options to meet your requirements. We can provide traditional fitted benching or free-standing units. The Techline range uses robust modular units and is suitable for perimeter or peninsular arrangements. 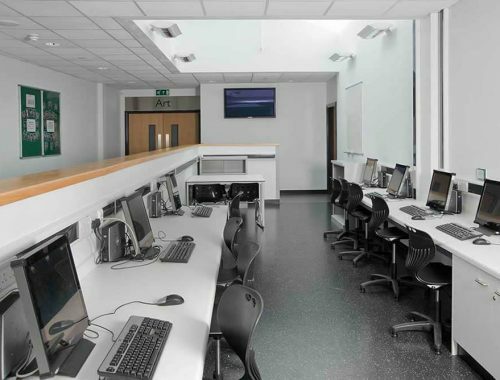 Our long experience and expertise in designing computer rooms, from limited budget refurbishments right through to complete new build IT suites, is available at no obligation. On behalf of Kier Group and the team at Brannel School; we would like to thank Klick on their efforts and performance on the installation of the fitted furniture package. A combination of helpful backroom staff and on site workers ensured an efficient completion of works. Browse our latest ICT Case Studies using the arrows below or click to view all case studies.